For all the writing I do about grinding my own meat, trying to find more local sources for produce and protein and keeping an eye on my caloric intake with the Lose It! app, I’m still the kind of guy who dreams about heading to Taco Bell, throwing down a few bucks and scarfing down a small mountain of faux Mexican food. I like to think I come by it honestly. You see, Toledo, the town that I’m from actually has three T-Bells on one of the city’s major thoroughfares with the two furthest ones only about 20 minutes from each other. As a kid and young adult, we’d head there and get food and I kept that tradition alive into my adulthood our here in New York. Heck, I even stopped there the day I heard about a rash of Bell-based food poisoning outbreaks about five years back. After hearing the news on the radio I thought, “Mmm, Taco Bell. I’m sure I won’t get food poisoning (and I didn’t, at least that time). There was even a part of me that was ashamed that it took me so long to actually taste a Dorito-flavored taco shell at the restaurant. It’s the same part of my brain that misses seeing big-time superhero movies in the theater on opening night. It’s just something the old me would have done in a heartbeat that older me can’t without lots of scheduling and worries of health and whatnot. Anyway, last weekend my wife and I both checked our points and decided to get some dinner at T-Bell while we were out running some errands. 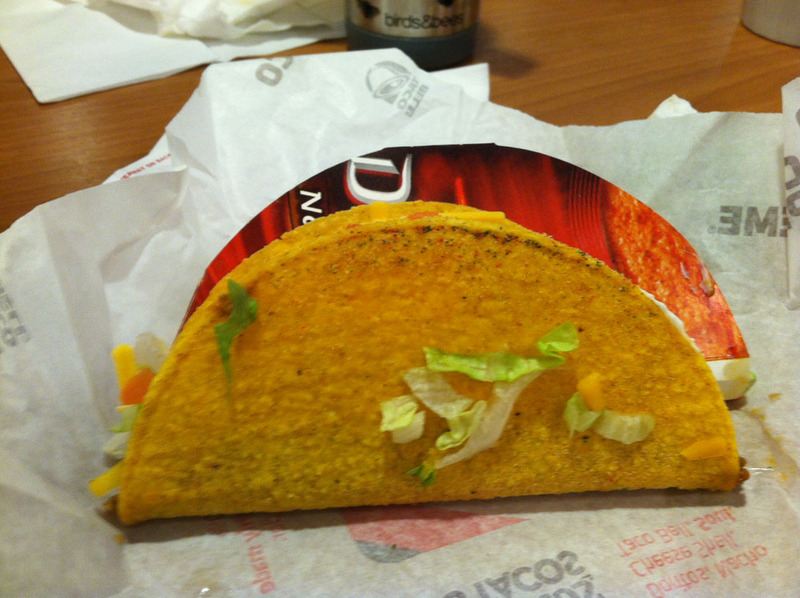 Of course, we both had to try the Cool Ranch version of the taco, something we were both excited about. Heck, much like the above commercial, I was one of the people who immediately said, “They should do Cool Ranch” as soon as I heard about the regular Dorito taco shell. As it happens, Cool Ranch is my favorite Dorito flavor, though much like Taco Bell, they’re not really a regular part of my life anymore because I will eat a ton of them in a single sitting and that’s not good for someone who counts going to the grocery store as exercise. So, I should get to the main event. I tried the taco and it was pretty good, but definitely salty. My wife read some account that said the flavor of the heavily spiced meat tends to wash out the Cool Ranch flavor, so I went in making the conscious decision to put my tongue directly on the shell every time I bit. That way, I definitely got the flavor every single time. And it definitely worked. I’m still not one hundred perfect sure if this fits in with the “two great tastes that taste great together” category as one definitely seems to outdo the other, but I’d say it’s a fun experiment with pretty good results.